At BIAFF 2009 Der Marterer by Bernhard Hausberger & Klaus Hümer (members of Videoclub Zillertal and Videoclub Liechtenstein) got 4-stars. Almatrieb - the cow parade, is at the centre of the film. About half a million cows in Austria spend the summer months on high alpine pastures. In the autumn they are brought back to the valleys. If there have been no accidents during the summer, this becomes a triumphal parade with the animal decorated in floral headgear. Traditionally it was the occasion for festivities, music, dance and parties. Nowadays it is also a huge tourist attraction. I dont think that he martyrs animals  its just the name of the family! Perhaps the Reiter family in Schwaz in the Tyrol was hard to themselves, perhaps they martyred themselves? Nobody knows today. 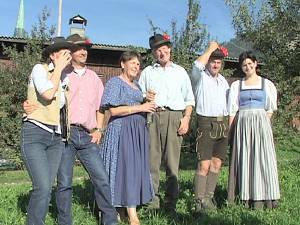 So the Marterer family is just a normal farming family, living in an old fashioned style, very traditional and very ordinary. They are hard working and nice people, close to the beautiful landscape of my beloved Tyrol, where I also come from. It was in August 2002, when Klaus Reiter, the farmer himself called me and asked me to do him a favour. What about? Of course I knew that he did not want to learn English, so it was clear that he needed me as a videot to make a film. When I heard that he wanted a film about an Almabtrieb I was not very amused. Why? Its too ordinary an event to make a good film. Besides I have already filmed it 20 times  what a boring theme! And as you know, Im always trying to find distinctive subjects. But, I always listen and so I did. After Klaus told me everything, I changed my mind and became interested in making this video! During the summer months the cattle are in the high alpine pastures. The grass and hay in the valleys are brought into the stables for the winter months, while the cattle feed high up in the mountains. At the end of the summer the cattle are brought back to the stable and thats a great festival. The cows are decorated and they really seem to be very proud when they are driven back. The celebration ensures everyone sees that things went well during the summer months. No member of the family died, everybody is happy. It always was a very nice tradition  but today it is a very brash, noisy, tourist celebration . Times have changed, tourism has increased and brought thousands and thousands of tourists to the Almabtrieb. And theres more money if they do it more often  every Friday and Saturday, next weekend again and also the weekend after. OK, the tourists enjoy it, some farmers get bells for the cows or money from the tourist agencies. But this Almabtrieb was different, absolutely different. And the family was different. Klaus had a dream, he wanted to have a film about the most spectacular and most beautiful Almabtrieb that I should ever see. It almost seemed as if he had a special feeling in his heart, but I will tell you about that later. So in September 2002 I visited the family on their farm in Schwaz and watched them preparing the decoration for the cows: flowers, badges, ribbons and so on. Father Klaus, his wife Greti, sun Hansjörg, daughter Judith - they spent many hours together and shared much joy and happiness. Then there was day of the Almabtrieb  and overnight winter had returned at full strength. There was more than a metre of new powder snow and no chance of bringing the cows back that day. So the Almabtrieb was cancelled in 2002 and Klaus was very sad because it should have been the last Almabtrieb of his life. Did he have some special feeling? I will tell you later. Now Karin and I had more time and two weeks before the Almabtrieb, we visited the farm crew in the alpine pasture and spent a weekend there. It was very interesting to see how the crew milked the cows, how they produced cheese, fed the pigs, lived together and had a lot of fun with Melkermuas, (a culinary speciality - made with flour, butter, butter-milk and salt and cooked like a pancake) and gambling, making music and dancing in the evening. So we really enjoyed it and looked forward to the great day. It started at 3 a.m.
Klaus Hümer, a member of the Videoclub Zillertal went into the Eng (the name of the alpine pasture) and spent the night with the crew. At three oclock in the morning the event started  breakfast  preparing for the day and leaving the Eng at 4.a.m. It was completely dark, except for the torches and the spotlight of the video camera. For hours and hours the cows went up the mountains  up and up  higher and higher, up to more than 2000 metres above sea-level. And at 7 oclock came daybreak  what a beautiful day! No clouds, brightest sunshine and a happy Bernhard Hausberger on the other side of the mountain waiting for the cows. Since 5 a.m. I had been waiting at Stallenalm village. Then I saw them for the first time - on the other side of the mountain, about a kilometre far away. But I never saw such a kilometre of landscape. Well, of course I had done, but not one filled with cows. There was an incredible, narrow path along the mountain, which goes down more than 600 metres, and is amazingly steep. Just imagine: the cows had been using this narrow footpath for many, many Almabtriebe, but never had a cow fallen down. I got nervous, when I saw the animals moving on step by step. I was really excited, and the cows, they seemed very calm. So, a long explanation, but Stallenalm was reached without any problems. A glass of Schnapps for the crew, two glasses of Williams with pears for me, and then the road through the Stallenvalley. And that was not a problem at all  you could see steam coming off the cows of course. 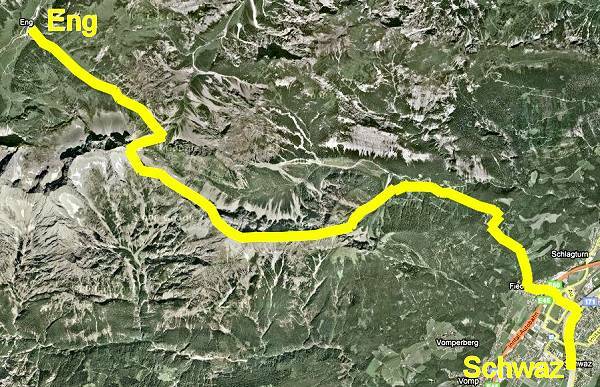 The footpath all together was more than 34 kilometres long. Angelika was the cleverest cow I ever saw. Suddenly Judith told me to watch her. And it happened again just as for the last three years. Angelika was tired and she didnt want to go on. She stopped and waited. And? It didnt take long and she had her taxi. She was picked up by a farm truck, her own private taxi, which brought her back to the farm. How funny and clever! At midday the cows reached Fiecht (after a walk of 8 hours), and I was tired, too. Lunch time! The crew was hungry and the cows needed a rest. At two oclock many helpers came and decorated the cows in a very lovely, colourful way. Beautiful!
. and I also had to run. Thank heavens I still had two lungs at that time, so I could follow the cows. The last 5 kilometres took the cows just 40 minutes and then they were back home. Who says that cows are silly? They never are! They were well aware of what happened on that day and they enjoyed it, I was sure about that. I could see joy and happiness everywhere. And tourists. Of course there were many of them in the main street of Schwaz, but Klaus took no notice of them. Im sure he was not even aware of them, because he doesnt like that. So Klaus Hümer and I just watched and were surprised and happy because of the film. I already knew that this film, The Marterer, would be a very silent highlight in my films. Then I edited the film for Klaus, the farmer. Of course that version of the film was for him and his family and lasted more than an hour. It showed life in the alpine pasture, included many interviews and much more detail, but it was a film for the family and not for competitions. So we had a lot of success. I was surprised. And a year later I gave Klaus the short film, I hadnt seen him for more than a year, but Klaus had changed. He had the dream of his last Almabtrieb and then he had this film. His dream came true and Klauss life came to an end. A few months later  in October 2006 he died from leukemia and Im sure he knew that before. He thanked me for the film, he also visited me when I was having my lung tumour treatments in 2005 and 2006. He helped to cut the nut tree in my garden. I was able to help him have a film about his very special and spectacular Almabtrieb, but I could not help to save his life. Klaus Reiter, the Marterer farmer in Schwaz in Tyrol will always stay in my heart, he was a very special and hard working man.